Themify Ultra is a flexible and powerful multipurpose WordPress Theme created by Themify. Powered by the Themify Builder, The Ultra WordPress Theme makes it easy for you to create any responsive WordPress websites quickly and beautifully. Ultra WordPress Theme comes with design skins and pre-made demo sites allowing you to setup sample sites within minutes. With a one click demo import system built-in, all settings including theme settings, content, menus, widgets, etc will be imported, to look exactly like the demos. Currently Ultra comes 8 demo skins, which are suitable for a variety of niches. The Ultra WordPress Theme allows for full control from header to footer, either for the entire site or on a per page basis. You are free to create different looks for every page, should you wish to. You can select from 15 preset header styles, with a sticky header and mega menu option included. And you can even set no headers to a page, which is great for landing pages. With convenient preset typography and colors, you don’t need to bother about font pairings and color combinations, just mix and match! Or should you prefer, you can choose from 600+ Google fonts and define your own colors. For treatment of images, you can apply CSS3 image filters and its hover effect without writing a single line of code. Works for site-wide images or individual image. You can set fancy looping CSS3 animated background colors as well. For designers, agencies, freelancers and artists, Ultra, comes with an optional portfolio custom post type which you can use to display your works. And for retailers, Ultra is fully compatible with WooCommerce to set up an online shop. In addition, a copy of Ultra WordPress Theme, comes packaged with the Themify Builder, a drag and drop page builder that includes 60+ pre-designed layouts, so you don’t have to create layouts from scratch. Just load your desired layout and compose! 11 Bonus Builder Addons are also included. Valued at $100, purchasing the Ultra theme will give you access to all these bonus addons for free. Comes with a bonus theme and one year of support and updates. Use on unlimited sites. 30-day money back guarantee. 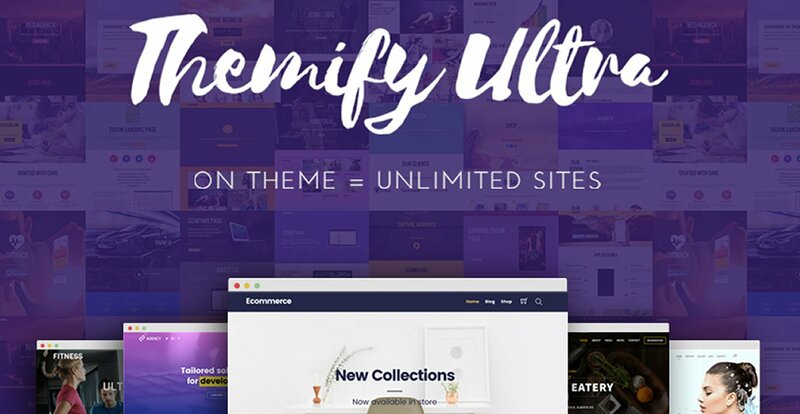 or Join the Themify Club for access to all themes – From $79.